The lucky, first recipient of the BPOA- Peter Seabrook Bursary is Jamie Satterthwaite, a 20 year old, second year BSc Horticulture student from Bridge of Weir, Renfrewshire, 7½ miles west of Paisley. Jamie studies in Edinburgh at the SRUC (formerly SAC), Scotland’s Rural College and lives in Broughton Road, close to the Edinburgh Botanic Garden. He is taking part in a three year course and is currently working during his Easter break on some course work as well. In addition, he has been fortunate to find part time, paid employment with well known, Pentland Plants which is handily situated a little way outside the city in Loanhead. David Spray, a long standing BPOA member and managing director of Pentland said that they were pleased to have an enthusiastic young employee and, at the same time, to be able to help him with his chosen career. 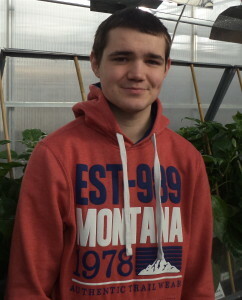 Naturally, Jamie’s academic work takes in studies of plant physiology, soil science, plant genetics and crop science. He is part of a relatively small group of 8 students in production horticulture and there are also 30 students working in Plantsmanship and 4 more in Garden Design. He is working on reports and essays and a practical project in which he intends to study the development of rooting systems using tomato plants. He says that he is privileged to be able to use the college facilities to perform this trial. In the photo, you can see him with a background of chilli peppers which one of his colleagues is using to make a trial on spray treatments and the affects of spray residues. It is interesting to note that Jamie has developed his interest in Horticulture from a period of holiday work over three years with a friend’s nursery close to Dundee; a familiar pattern often repeated. It seems to take a period of practical experience to appreciate the possibilities of employment in horticulture. In addition to which, Jamie has an interest in playing the bagpipes, cycling and keeping tropical fish amongst other things. At the end of this year’s studies he intends to travel for a month to further his studies before returning to Edinburgh to complete his final year. If you have any leads to employment in Holland for later this summer on container pot plant nurseries, let us know.